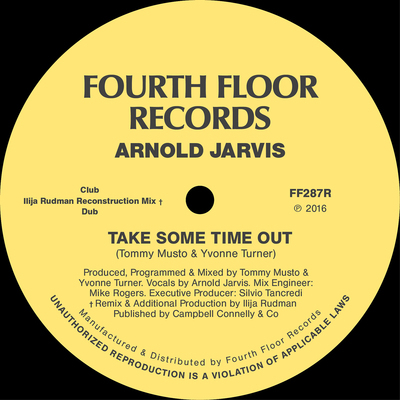 Arnold Jarvis’ ‘Take Some Time Out’ was first released in 1987, the year that Fourth Floor Records was born, and it stands the test of time as a seminal release for the label. The track characterises the productions that keep some of the house music world returning again to its catalogue for inspiration. This vinyl re-issue includes the Club and Dub that made up the original release, plus a ‘Reconstruction Mix’ by Ilija Rudman. Ilija delighted Classic Music Company earlier this year with his minimal take on disco in track ‘In Her Eyes’. His approach to the ‘Take Some Time Out’ re-work has the same deconstructed vibe; the loose percussion and punchy melodic bass gives a pleasing spaciousness to the track, giving the record fresh life and re-imagining it for 2016. It’s out now on vinyl with a digital version released on 25 November.